Though winter is just getting ramped up, don’t forget about that beautiful vinyl in your boat. Before the waves start slapping against the sides of the boat, there are a few tips to caring for the vinyl in boats that if followed now as the vessel is prepared for the season, and then during the season, will prevent plenty of headaches and expensive repairs in the future. • Vinyl is not as flexible in the cold as it is in hot weather, so be careful stepping on cold vinyl – it will rip easily. 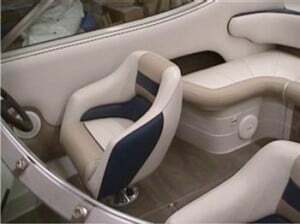 • Use clean water and a general purpose vinyl cleaner (neutral PH) not water by itself, to remove oil, dust, and grime from the vinyl seats and vinyl trim at the start of the season and every time you use the boat. Don’t use lake water because the minerals and dirt in most lake water will stay on your vinyl – acting sort of like sand paper and wearing it down when people start getting in and out of your boat. • Sunscreen, body oils and sea salt also act as abrasive surfaces that break down vinyl as people move around on your seats. Those same oils can get baked into the vinyl as it gets hotter because vinyl becomes more porous in the heat. It’s best to clean the seats after every use, not matter what the temperature is. • Tree sap is one of the worst things you can get on vinyl because sun and heat can melt the sap into the vinyl. Clean the sap off quickly if it does land on the vinyl. • If you get a hole in a vinyl seat, make sure the inside of the cushion is dry before repair. • Pay close attention to your boat cover – it should cover all vinyl surfaces. Besides keeping the boat cleaner it keeps sunlight from damaging the vinyl. Try to leave a vent when your boat is covered so moisture in the boat can escape.